Storm damage and flooding were reported across portions of Middle Tennessee after storms moved through Monday afternoon. 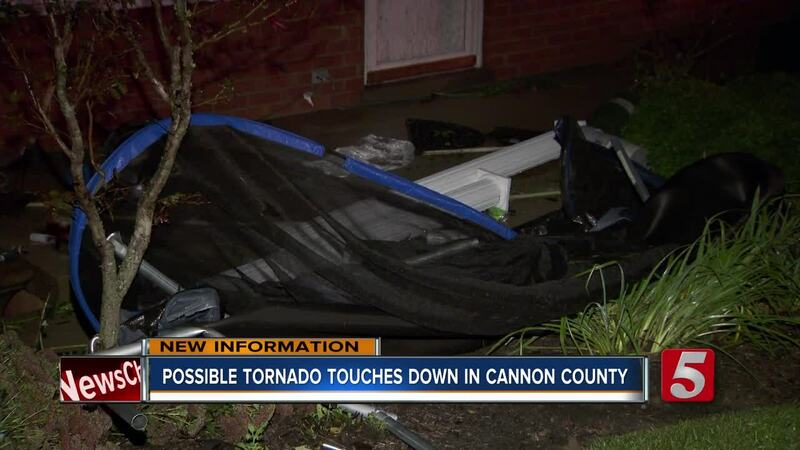 The National Weather Service has confirmed that an EF-0 tornado touched down in Cannon County Monday night. Cannon County residents began cleaning up after the storm moved through around 4:30 p.m., ripping off and partially damaging several roofs. At least four homes were damaged on Bradyville Road. Witnesses said they saw "rotation" and a "possible tornado." On Tuesday, the NWS confirmed it was a tornado with maximum winds of 85 mph. They said more details, including path length and path width, are still being determined. Witnesses stated the tornado skipped along its path. Officials said it was only on the ground for one to two minutes. Flooding was also reported across much of DeKalb County, especially near Alexandria where viewer photos/video showed water flowing along the roadside.